The famous French wine-growing area is located in the east of the region Bordeaux and forms with Pomerol the core area of the so-called Rive droite (right bank) of the mouth funnel Gironde and the Dordogne, It is named after the small town of about 2,000 inhabitants, situated on the slopes of a hill above the Dordogne valley. She bears her name after the saint Benedictine monk Emilion (Aemilianus). He lived here according to legend in the 7th century in the forest of Combes in a cave, which is today on the property of the Château Laniote located. Saint-Émilion is also a stop on the Way of St. James to Santiago de Compostela. It is one of the oldest vineyards France because the Romans planted the first vines here. In 1999, Saint-Émilion was the first wine growing area in the world to be declared by UNESCO World Heritage appointed. The vineyards cover about 5,500 hectares of vineyards, which are managed by over 1,000 wine growers. 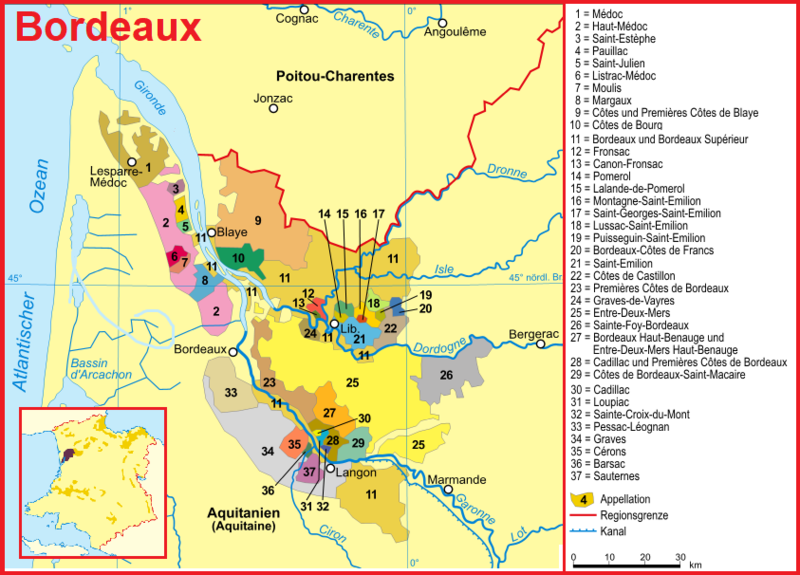 The ten-by-five-kilometer-wide area includes, besides Saint-Émilion, the communes of Saint-Christophe-des-Bardes, Saint-Hippolyte, Saint-Étienne-de-Lisse, Saint-Laurent-des-Combes, Saint-Pey-d'Armens, Saint-Sulpice-de-Faleyrens, Vignonet and partly Libourne, The four municipalities separated by the small watercourse Barbanne Lussac. Montagne. Puisseguin and Saint-Georges are independent appellations published on the label may indicate the place name with addition Saint-Émilion. The climate is more continental and not as maritime as in the west Médoc and has larger temperature fluctuations. The vineyards are between 25 and 100 meters above sea level. The area is characterized by a variety of soil types, often even within the individual châteaux. Roughly subdivided into the four zone plateau (limestone formations with clay limestone or sandy clay), côtes (similar but different slope and orientation), graves (gravel and coarse gravel) and sables (alluvial gravel). These floors also provide a variety of types of wine. For the most part will be red wines produced, only these have the Appellations status, The full-bodied and full-bodied plants with silky texture become the dominant variety Merlot, which occupies about 60% of the vineyard here, as well Cabernet Franc (here Bouchet) with shares of Cabernet Sauvignon. Cot (here Malbec, Pressac) and Carmenère (also Carbouet) produced; the typical grape varieties of the Rive droite, Long and Barrique in mostly new barrels of French oak are common. They are gentler, more fruity and less tannic than those from the Médoc. The best Grands Crus with the addition of "Classé" enjoy the status of classified plants. The classification applies exclusively to the Grand Vin (First wine) of the winery and can only be valid for a defined part of the vineyards. All other wines like second wines or white wines have to be on label give the main name a different name than the first wine. For example, the second wine carries from Château Cheval Blanc the name "Petit Cheval Blanc". In rare cases, there may also be two first wines with a different name for each winery (see eg at Château Faugères ). The classification system is not as rigid as that of Médoc and is regularly revised (see regarding the confusingly different classifications in France under Grand Cru ). In contrast to the Médoc, the vineyards (ie the boundaries of the vineyards) of the wines included in the classification can not be freely altered. This provision has already led to declassifications in the case of mergers of wineries with different classification (Example Château Beau-Séjour-Bécot ). The first classification took place in 1955, the others were then 1969, 1985, 1996, 2006 and most recently 2012. The total number of classified wineries is limited to a maximum of 90. In 1986 there were 85, in 1996 there was a reduction to 68, in 2006 to only 60 and in 2012 a large increase to 82. After the 2006 classification, however, there were protests by downgraded wineries. The four outclassed Château Cadet-Bon, Château Guadet, Château La Marzelle and Château La Tour-du-Pin-Figeac brought a protest or contestation of the result at the Administrative Court in Bordeaux (except the Château La Tour-du-Pin-Figeac Incidentally, the other three were re-classified in 2012). After examining the facts, the court found that it was grossly flawed to first taste the wines of already classified wineries and then separately the others. All had to be tasted together. As a result, there was a confusing back and forth. First the Classification 2006 except those of 1996 was put into effect, discarded and again confirmed the 2006 upgrading of eight Châteaux, this discarded and finally on May 13, 2009 made a "final" decision. Now the classification was valid again in 1996. In a footnote, however, it was noted that the 2006 upgraded eight Chateaux (6 Grand Cru Classé and 2 Premier Grand Cru Classé B) may keep their new rank. The classification in 2012 was carried out under the supervision of INAO by a jury of seven professional tasters, In order to guarantee independence, no members of the Saint-Émilion-Syndicat or the Bordeaux wine trade below, but professionals out Burgundy. . Loire. Provence and Rhone, The wine review took place by means of blind tasting with a 20-point system, At least 14 points were required for the Grand Cru Classé and at least 16 points for the Premier Grand Cru Classé. There was an increase from 60 to 82 farms, reflecting improved standards in the winemaking and greater consistency of the rating. The shock caused by the many declassifications in 2006 has obviously motivated much effort. There was with the Château Corbin-Michotte just a declassification. This classification will probably be valid for the next 10 years (until 2022).